ZmanimClock | The world's first clock to run on Shaot Zmaniot. The world's first clock to run on Shaot Zmaniot. How is this Clock Different From All Other Clocks? 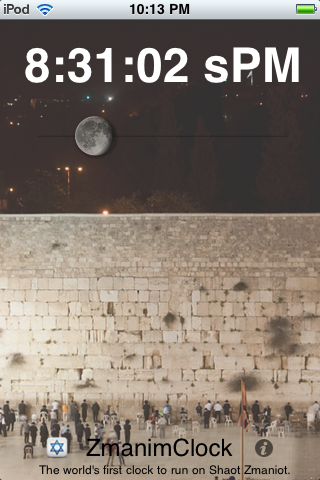 For the first time in history, the combination of a portable device that has GPS capability, a screen, and computing power to calculate sunrise and sunset times, allowed for the creation of a clock that runs on shaot zmaniot, the seasonal hours described in the Talmud that determine much of Jewish time-related practice. Welcome to ZmanimClock, the first clock to run on Shaot Zmaniot, an ancient way of keeping time that varies from day to day and place to place, depending on the number of hours of daylight in the day. For much of our lives, it is helpful to see the passage of time as a constant heartbeat, against which we can make scientific measurements or schedule appointments. In this conception, 1 hour is roughly 1/24th of the time it takes the earth to rotate on its axis. There are times, however, when the passage of time is not regular. Daylight hours on a long summer day seem to stretch into the evening, and long winter nights can cause sadness and even depression. 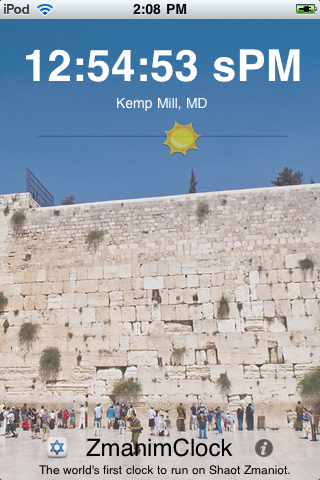 The rabbis of the Talmud were aware of these differences, and set many times in Jewish practice to align not with an absolute time, but with how much of the daylight had actually elapsed. On ZmanimClock, sunrise is fixed by convention as "6:00 sAM", where "s" stands for seasonal time, to differentiate from the "real" 6:00AM. Sunset is fixed by convention as "6:00 sPM". The real time between sunrise and sunset (which is >12 hours in the summer and <12 hours in the winter) is split into 12 equal parts, called "shaot zmaniot", or "seasonal hours". On this clock, the sun at 12:00 sPM is always exactly halfway across the sky, and at the equator you would have no shadow. At 12:00 sAM the night is exactly half finished. Watch the seconds go by faster during winter days, as the clock races to cover 12 seasonal hours between sunrise and sunset. During the summer, watch time go by slowly, as the minutes stretch out to cover the longer days. Always know exactly when the sun will rise and set, anywhere and anytime. And keep track of halachic time as simply as it was meant to be, without resorting to time- and place-specific tables to understand how the zmanim, the halachic times, fall out. ZmanimClock runs on your iphone or ipod touch. Learn More! 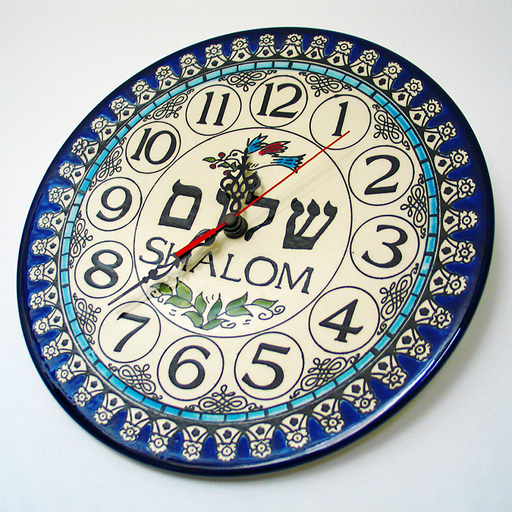 Many of the times used in Jewish practice are Seasonal times. ZmanimClock is live on the App Store. Get it now!